This year has been a really exciting one for new design tools entering the market. Photoshop has become something of a dirty word, and although it’s still one of my weapons of choice, internet-makers are fighting back with a plethora of tools that aim to make your life as a designer that little bit better. Static mockups are becoming less useful and the lines between designer and developer are becoming increasingly blurred. As we work more collaboratively with one another the tools we use are having to change. The era of the HiDPI screen is here and dominating our devices, and designers are having to find new processes that help them produce designs that are more accessible across these devices. 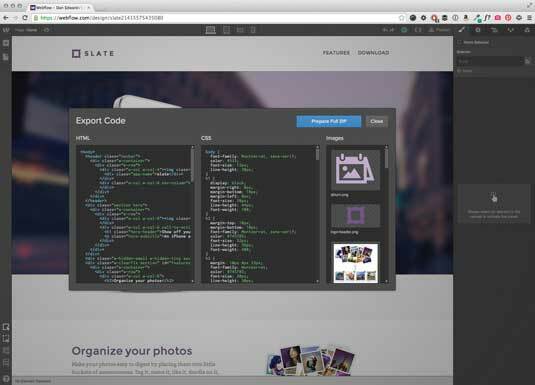 Pixate is an app that has been created for making intuitive, interactive prototypes for iOS and Android. What sets Pixate apart from other tools I’ve used is its drag-and-drop animation and interaction panel. To make an element interactive, all you need to do is simply select the interaction you’d like to use, be that double-tap, drag, tap or one of the other native interactions it provides. Drag this onto your element, set some variables, and voilà – using the Pixate iOS or Android app gives you a real-time working prototype on your device. The app allows you to build up an asset library really quickly. To start creating your prototype, just drag and drop your assets into the app and you’ll find them in your layers palette ready to use. 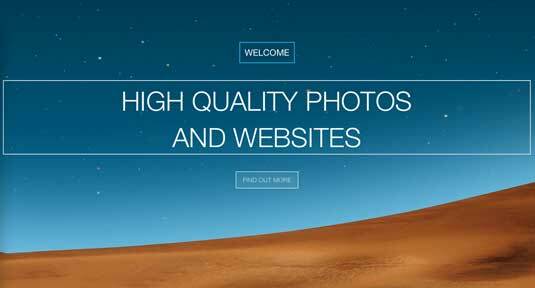 What I really enjoyed about Pixate is how simple it is. Every part of the app is really clearly and thoughtfully designed which makes it easy to understand. And if you’re not quite sure on what something does, the live feed onto your device allows you to experiment and see how it effects the design in real time. Affinity by Serif has been dubbed the ‘Photoshop killer’ by some, and it’s easy to see why. My first impressions are that the app is incredibly well designed and that it feels like it’s been made to be a dedicated web and graphic design tool. There were a few features that I really enjoyed, including adjustable nondestructive layers – which essentially means you can adjust images or vectors without damaging them. The 1,000,000 percent zoom was just bliss (very often Photoshop’s 32,000 feels like it’s just not enough). This is especially useful when working with vector art, as you can really get in close. The undo and history features are also really handy – Affinity allows you to go back over 8,000 steps! When it comes to designing, the UI feels familiar. When moving from Photoshop, everyone seems to want to start over, which can pose a real challenge. What Affinity has done is kept the layout familiar while tightening everything up and hiding distractions. I was easily able to jump straight in and get designing. Overall, Affinity feels like it could be a real competitor to Photoshop, Illustrator and Sketch, and at just £34.99 it’s a real bargain! 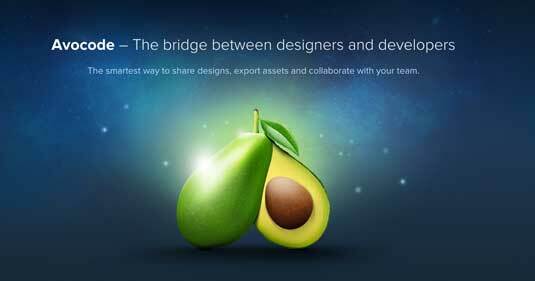 Avocode makes it extremely easy for a frontend developer to code websites or apps from Photoshop or Sketch designs. It’s built by the same team that brought us CSS Hat and PNG Hat, so it’s not surprising they’ve taken the exporting process one step further here. Although previous apps have allowed you to export assets, what makes Avocode really special is that you can use its Photoshop plugin to sync your PSD into Avocode with just one click. Avocode quickly and automatically analyses your PSD or Sketch file and brings everything into a beautifully designed UI. You then have full control over how you export assets, including SVG exporting as standard. You can also click elements in the design, and copy and paste the code into a text editor of your choice. It looks like there’s going to be Atom integration soon, which will make this process even slicker. Overall, I’m not 100 percent sure any app can ever replicate a developer. However, I’d happily use this to turn PSDs and Sketch files into interactive designs that could form the foundations for the website build. 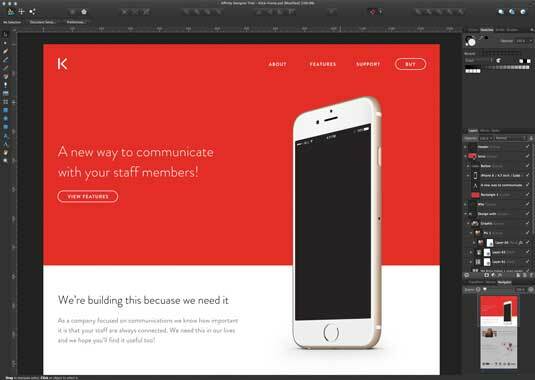 Antetype is a new tool for creating responsive UIs for apps and websites. It feels like its been built to do just one job really well: to create high-fidelity prototypes, but not production files. This is actually a good thing – the team is focused on exactly what it is creating, and it’s not trying to make an app that replaces developers. On download you’re given a fairly basic widget library, which you can use to quickly create prototypes and start designing. Antetype provides a library of devices and OS designs including iOS, Android and Windows to start with. There is also an active community section on the site, where you can download UI kits from other Antetype users. The thing that sets Antetype apart from other prototyping tools I’ve used is that you can actually create responsive prototypes and add some neat interactions – ideal for presenting ideas to a client. It feels a bit too ‘drag-and-drop’ for my liking, and the UI isn’t stunning but it is very efficient and quick to learn. Spend some time with it and you can create very effective prototypes, very rapidly. Sketch has gained a massive following since it launched in 2009. The speed at which Bohemian Coding (the creator of Sketch) is moving is very impressive. The latest version includes great new features such as improved exporting, symbols and simplified vector modes. 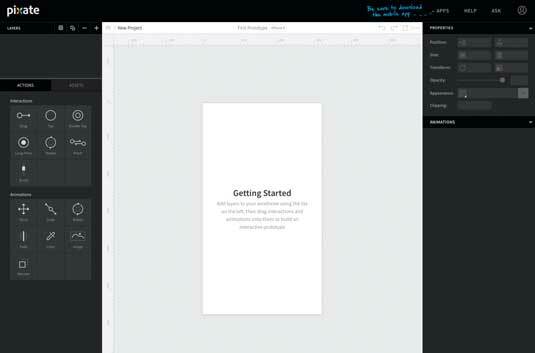 “When we set out to build Sketch, we envisioned an app for the modern digital designer,” says Pieter Omvlee, founder of Bohemian Coding. I had used the last version of Sketch for a limited time but found it to be buggy and not to my liking. However, after using Sketch 3 for a few hours I was pleased to see those bugs had been ironed out and the app overall much improved. 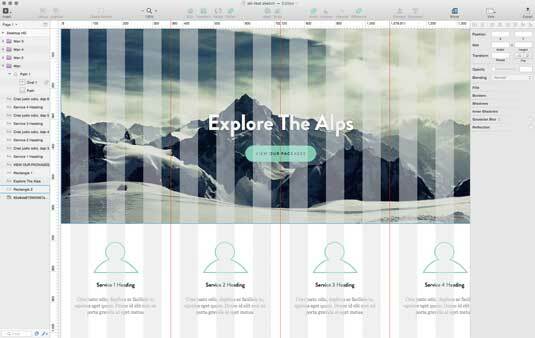 It’s great to see features such as the new grid tool, which makes it easy to create grids for your designs. I also really like how Sketch has incorporated CSS logic into the app. This makes converting your designs into CSS much easier, as you have to use CSS logic when applying styles. Another feature which is really handy for speeding up the design/development crossover is Automatic Slicing. Without having to manually add slices, Sketch can create assets using one-click export, which will be exported at 0.5x, 1x, 2x and 3x and in various formats such as PNG, JPG and TIFF. I’m looking forward to seeing what Sketch does next. Form is a prototyping tool like no other I’ve tried. It’s not a typical design tool in that there’s no tools or layers palette. Using the app feels like a mix of design and code. While you can’t actually create graphics in the app, you can insert them and use what Form calls ‘patches’ to add gestures and interactions. The Mac app requires you to also use the iOS app so you can view your prototype in real time and interact with it. There are some great tutorials on how to use Form, but the process is rather complex if, like me, you are used to creating visuals in Photoshop. Moving an image to the centre of your device, for example, is achieved using Superview variables and Match Patches. Once in place you use maths to divide the width and height and connect them to the X and Y positions in Image View. Group those together, rename the variables and adjust the X and Y anchor points. I found this process fairly complex. However, once you get your head around the processes, you can create stunning prototypes. Having access to the device’s camera and other sensors means the prototypes you create are just as powerful as the coded app would be. UXPin is a wireframing and prototyping tool that has been designed to not be limited to just one thing. You can use it to create rapid low-fidelity wireframes just as easily as hi-fidelity interactive prototypes. Using UXPin is a really pleasant experience – you can tell it has been built by a UX Team! I love that the team allows so much flexibility within the app – you can opt to start with an empty iPhone app or responsive website template, where you design everything in the app. Or, if you have a design you want to prototype and add interactivity, there are tools to import a project from Photoshop or Sketch. If you’re starting from scratch then you can use one of the many element libraries, which include UX patterns from frameworks such as Bootstrap, Foundation, iOS and many more. This is particularly handy if you want to make a rapid wireframe. Making high-fidelity prototypes with interactions is also really easy and super-smart. Select an element such as a button, and you are then guided through a step-by-step process of adding the interaction. It’s really easy to do and very effective. Finally, sharing and commenting on designs is really simple too. A point-and-click interface makes it easy for clients to add comments on certain elements and have them reviewed. I’d definitely recommend giving this a try for your next wireframe or prototyping project. Macaw was built with designers in mind, and without touching any code you can create responsive designs that look and work great across all devices. I was immediately blown away by the simplicity of its design, and the app feels nice and familiar. After watching a few videos I got stuck into designing a simple page layout. 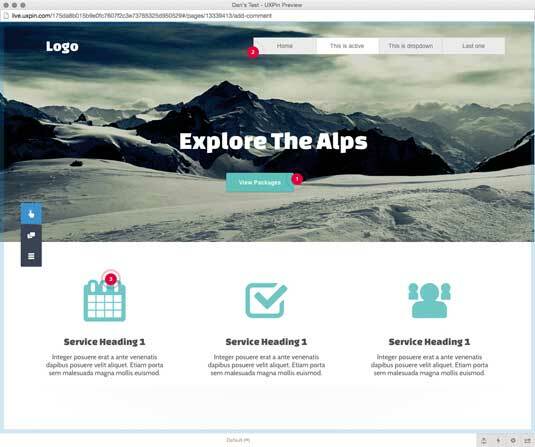 Within 30 minutes I was able to create a responsive template that worked pretty well. I really enjoyed how the app allowed you to bring up options to adjust the layout and would represent this in real time, enabling you to see how the changes would actually effect the design. This was even more useful when setting breakpoints. As the layout broke, I was able to tweak it to create a responsive layout without touching any code. The code the app produces is actually really well constructed and semantic. This is usually where apps like these fall down, but Macaw has managed some kind of code magic and got it right! I’m very excited to see where this goes. 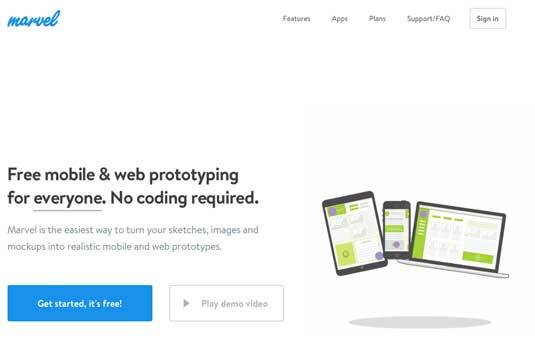 “We wanted to lower the barrier to bringing your digital ideas to life, so we created Marvel, a ‘code-free’ prototyping tool that transforms images and sketches into interactive prototypes that look and feel like real apps and websites,” says Murat Mutlu, who co-founded the tool. When you first open Marvel you’re asked to connect it with your Dropbox, which allows the app to grab the files it needs to create your project(s). If you don’t use Dropbox, there’s no other way to get your files into Marvel. Once you have your PSDs in place, you can use Marvel’s (beautifully designed) UI to hotlink your pages together. There are also some really handy features, including being able to create transitions between links/pages and quickly preview how these will look in the browser. Another great feature is that you can choose the environment for your project. So, if you want to create an iOS app, you just select it from the settings and the preview is automatically adjusted. I really like how simple the app is to use, and the ability to share it with staff or clients is really helpful. I’ll definitely be using this for my client work! 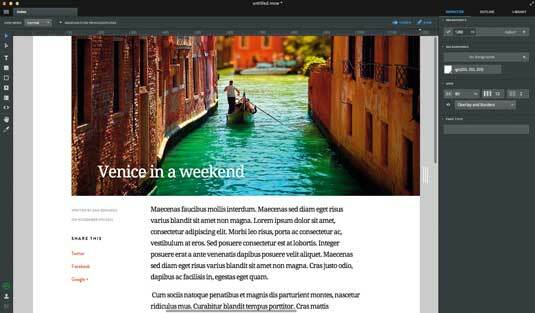 Webflow is a web app that allows you to design production-ready websites without coding. It has an unobtrusive UI that allows you to focus on the design. There’s an option to view the design at popular breakpoints, and a preview mode, which gives you full control over the viewport size. There are some familiar tools that allow you to design elements, but it’s all drag-and-drop (there’s no drawing tool) so you are limited with what you can create. This app takes code-free design to the next level. However, you do still have to understand how code works in order to create something that functions well. You couldn’t jump in as someone who knows nothing about design and just build a website, for example. This is definitely a good thing – Webflow makes you think about the code, without having to worry about it. It also allows you to publish your site and will host it for you for a monthly fee. Definitely one to try, even if just for prototyping.